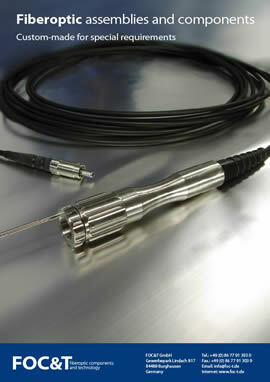 High Power cables and connectors from FOC&T are designed for guided beam laser systems. 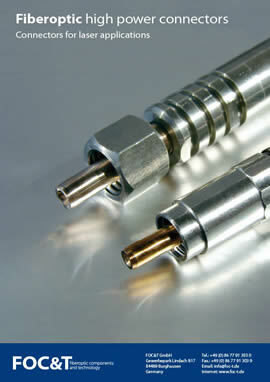 The connectors are made for launching high optical power, from Watt to Kilowatt ranges, into fibers. The connectors are resitant to high temperatures, caused by optical irradiation. Connector sizes and cabling are adapted from heavy duty industrial to difficult handheld applications. FOC&T is able to assemble fibers from 50μm up to 1000μm in different styles of connectors and protection tubes. Our assemblies, used in a wide field of applications, are bare fibers, pigtails, adaptorcables, both-end-assembled fibers and hybridcables. The assemblies are made on customer request. Metal mechanical components for fiber optics like connectors, adapters, ferrules, sleeves or custom designs are produced by FOC&T in-house on modern high-precission machines. This allows us flexible sizes of production lots. Wireless product identification and controlling. Protection caps, cable boots, cable and fiber tubes of FOC&T product lines are useable as accessoires for customer products.We let customers participate in the experience and know-how gained from our production, so we can offer tools and accessories for their special requirements. FOC&T was founded in the year 2000, based on 20 years of experience and knowledge in fiber optics. We have competence in mechanical parts like connectors, cables, tools, measurement technics in standard as well as custommade applications. 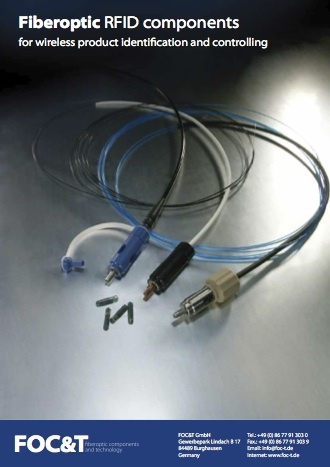 Important business lines of FOC&T are sophisticated connectors and cables for laser systems in ranges from low to high power applications. modern high precision machines and process controlling by our quality system guarantees high quality products. "Be open for new products" is our credo. FOC&T - fiberoptic components and technology is situated in south-east of Germany. Burghausen, a bordercity to Austria, is located about 100 kilometers east of Munich and 50 kilometers north of Salzburg.